Quincy Compressor in Bay Minette, Ala., makes rotary screw and piston air compressors, vacuum pumps and air treatment products. It manufactures these products totally in-house—making the parts, assembling the compressors and getting them out the door. Created with durability in mind, the compressors that Quincy manufactures serve a variety of industries, from agriculture to energy to pharmaceutical. The company wanted to increase market share to guarantee future growth. To reach this goal, it worked to increase its manufacturing efficiency and flexibility to meet current and future demands. It had to ease capacity constraints with new and existing products, which were compromising its ability to respond to increasing business opportunities, short lead-time orders and new product introductions. What was required was more efficient equipment in a flexible manufacturing cell that would easily achieve its precision requirements. 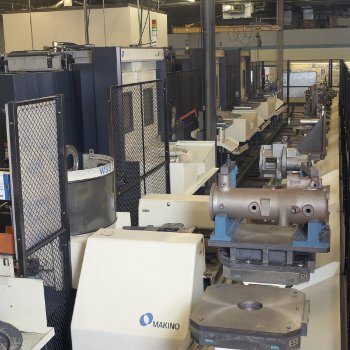 Quincy already had experience with Makino, so it again turned to the company to help it satisfy its precision and reliability requirements by installing a Makino Machining Complex (MMC). This approach included two Makino A88 4-axis horizontal machining centers. Shortly afterward, it upgraded this cell to include an A88E high-speed horizontal machining center. The cell uses a 30-pallet flexible manufacturing system to improve the machining of air compressor housings and air inlet castings. An automatic 244-tool changer on each machine accommodates all the necessary tools for common jobs. Single Source Technologies partnered with Makino to help deliver this automation system, serving as a local resource providing engineering services, supplies, application support and customer service. With sales volumes at a record high and production levels requiring 24/7 machining, installing the machines in two phases minimized interruption to Quincy’s operation. With this flexible manufacturing system, the company was able to fulfill all of its production demands and on-time deliveries. The cell has enabled Quincy to accomplish its goals by delivering an average uptime of 97 percent during production, decrease part cycle times, increase capacity and create more scheduling flexibility. In addition to reducing cycle times, the flexibility of the Makino cell has helped Quincy evolve its continuous flow manufacturing (CFM) capabilities. This evolution has enabled Quincy to produce parts in a just-in-time manner for each order as it moves through production. By improving is build-to-order environment, both waste and costs have been reduced while delivering on-time and defect-free parts. The flexible manufacturing cell allows for continuous production and quick turnaround, letting parts pass onto assembly in the same building.